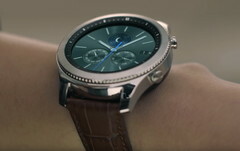 The latest software update for the Samsung Gear S3 smartwatch pushes the Tizen version up to 4.0.0.2, weighs around 300 MB, and comes with sleep stages info support for the Health widget, more indoor workouts and back-to-back workout for Samsung Health, improved Quick Panel UI, and more. Sadly, it is only available in the US for now. The Samsung Gear S3 has been around for a while, but until the South Korean behemoth launches a new smartwatch, a software update does not sound bad at all. In fact, the latest Gear S3 firmware comes with quite a few noticeable changes and it might even help some potential buyers to finally spend their money on Samsung's smart wearable. The new firmware carries the version number R760XXU2DSA1 and, once installed, it will bring the Tizen version of the Gear S3 up to 4.0.0.2. Its highlights include support for more indoor workouts and back-to-back workout in Samsung Health, sleep stages information support for the Health widget, faster and easier interaction in Quick Panel thanks to a redesigned interface, Theater and Sleep advanced modes in the watch settings area, re-categorized menus, support for over 1,000 emojis and the ability to save drafts in the Messages app, and more. According to SamMobile, the update is only available in the US for now, but other markets should get it as well since these updates usually roll out in stages. The size of the update is 300 MB, so keep that in mind before initiating the process. Those who did not receive an automatic notification yet can check manually by going to About Gear > Update Gear software in the Settings tab of the Samsung Gear app on the connected smartphone.